Home » Forum » MSX Talk » Development » How to detect the SCC? How to detect the SCC? I would appreciate if somebody could tell me how to (programmatically in Assembly) detect the slot/subslot which an SCC is connected to. Actually, I need to know the indicators that tell that an SCC is connected. If all succesful, this a slot with an scc. Repeat this test for all possible slots. RET	Z		; return if all slots & subslots are checked! 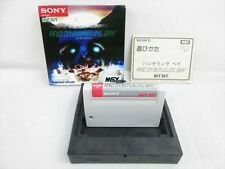 You can search for more than one SCC cartridge and choose the "best" one. Also SCC data will remain undamaged after search is finished. 1) two " pop af " are missing (one because of the PUSH AF and other because of calling CHK_SCC without returning). 2) I'm not sure if the data of the SCC remains undamaged since I get no sound after running the code. I will inspect what is going on. 1) As I mention before, I am not stopping search after I found first available SCC. I am making a table of all available sound cartridges. But if you want exit as soon as you found one, you can indeed do 2 x POP + RET. But if you have music re-player for SCC-I and you have found a regular SCC, you need to patch the player to hear any sound. But I could help more if I knew what you trying to achieve. Thanks to you both. It is working fine now. Sorry for resurrecting this post but the subject is related. Is there any reason for this code to not work on bluemsx when an SCC-I is plugged ? The SCC-I should start in SCC mode at boot, never the less, on bluemsx it is not properly detected. bit 7,(hl)        ; page 2-slot expanded ? cp (hl)           ; same value on 9cxxh ? bit 7,l           ; 128 addresses (registers) tested ? bit 7,b           ; test-slot = sec.slot ? bit 4,a           ; sec.slot = 4 ? cp 3              ; prim.slot = 3 ? Needless to say it seems a bluemsx relate bug, as it works fine on openmsx.